A robbery attempt at a Delaware County CVS sparked a standoff with SWAT officers. NBC10's Katy Zachry has details. Police in Delaware County took a man into custody after he allegedly robbed a CVS store and barricaded himself inside when police and a SWAT team arrived Wednesday night. Media Borough police said Kwesi Hudson of Wilmington, Delaware -- wearing all black clothing, a hoodie and a mask around his face -- entered the CVS store on 295 E Baltimore Pike in Media around 9:45 p.m. armed with a gun and announced a robbery. Police were notified after two employees inside handed over an undisclosed amount of money. As the suspect headed to the rear loading dock he was met by responding officers, investigators said. The suspect then made a dash for the front door where other officers met him, police said. The suspect then fled into a storage room near the rear of the store, police said. 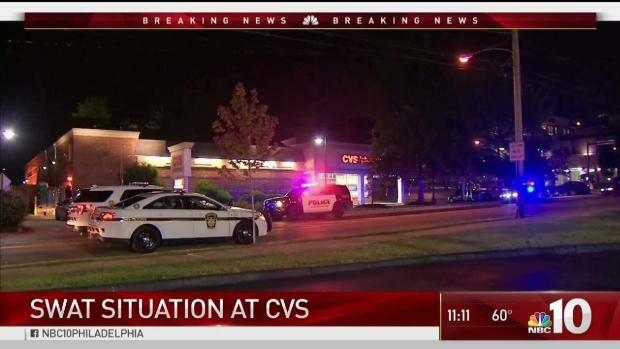 A SWAT team and police officers surrounded a CVS in Media, Delaware County Wednesday night after a robbery was reported inside. NBC10's Keith Jones is at the scene with the latest. A SWAT team then arrived at the scene. Investigators found the store workers unharmed in a locked restroom, police said. After a standoff, the suspect surrendered to police around 11:25 p.m. and was taken into custody. Police said they found a weapon nearby. "We are grateful for the fast response of law enforcement and that no one was harmed last night," CVS said in a prepared statement. "The store reopened this morning, and we are offering counseling services to the employees as a result of this incident." A judge arraigned Hudson Thursday morning on 23 counts including robbery, kidnapping, false imprisonment and assault. He remained jailed on $500,000 bail Thursday afternoon. It was unclear if he had an attorney who could comment on the accusations.